Gilaine O II with Craig Tafoya at Penumbra Marine representing the seller. Built by Azimut in 2005 and refitted in 2009, Gilaine O II accommodates 10 guests in five staterooms including a main deck master suite. A vast flybridge, almost the entire beam of the boat, features a wet bar, icemaker, barbecue and Jacuzzi. 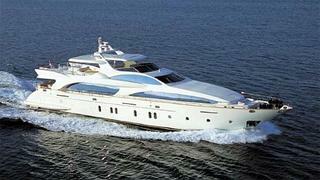 Twin 2000hp MTU engines give a cruising speed of 23 knots and Gilaine O II was asking $7.2 million.